Everyone has a story, and last week, we were privileged to hear Allison Nazarian’s incredible story of growing up as the grandchild of Holocaust survivors. Nazarian, the author of “Aftermath,” shared her inspiring and poignant reflections at the Jewish Federation of South Palm Beach County’s Women’s Kickoff. Women chose to attend either a morning or evening reception, both held at the Woodfield Country Club on October 9. 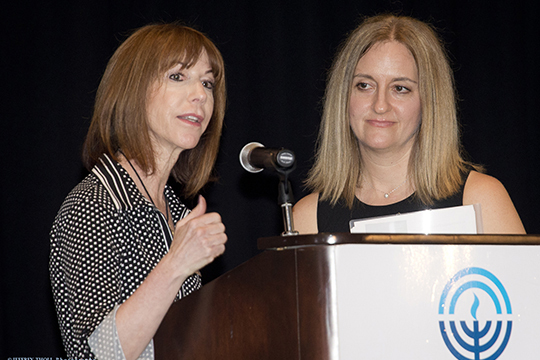 The morning program was chaired by Joanne Applebaum and Aileen Grebow, and the evening program was chaired by Sandy Gerstein and Mara Shapiro. The Dorothy P. Seaman Department of Women’s Philanthropy is generously sponsored by Wells Fargo. Thank you to our exclusive magazine sponsor, the Boca Raton Observer, and our in-kind sponsors, Ivan & Co Fine Jewelry and Southern Glazer’s Wine & Spirits.